Linyekula performing in "more more more ... future"
This feature was originally published in the September-October issue of Walkermagazine. 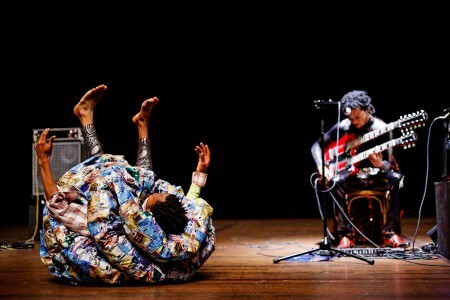 Faustin Linyekula performs at the Walker with his company, Studios Kabako, and guitarist Flamme Kapaya on September 23rd and 24th, and gives an artist talk on the 22nd. 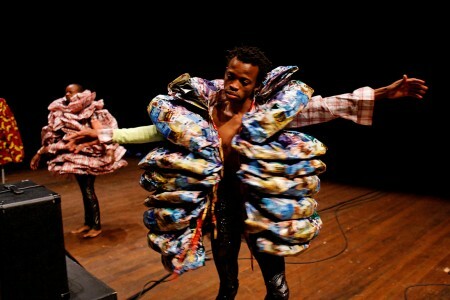 IN THE DECADE SINCE he returned to the Democratic Republic of the Congo (DRC) from a self-imposed exile, 37-year-old Faustin Linyekula has become internationally renowned for super-fluid choreography and dancing that combines intense physicality with formal innovation. While he remains committed to creating art in his home city of Kisangani, and also teaching and mentoring younger artists, his work has fed Africa’s global reputation as a hotbed of new dance. In 2007, he and his company, Studios Kabako, performed the audacious, four-hour-plus Festival of Lies as part of an artist residency at the Walker. Now they return with more more more … future, a work about political resistance and harsh economic disparities reflecting the uprisings around the world this year. In June, Linyekula spoke by phone with Philip Bither, McGuire Senior Curator for Performing Arts, about the origins of this work; making art in a country ravaged by civil war and a collapsed economy; and how hope, in and of itself, can be a form of resistance. Could you talk about the circumstances a few years ago that led to the creation of more more more … future—its inspiration points in terms of your broader work? But it didn’t quite turn out that way? Well, I started working with guitarist Flamme Kapaya in March 2008. I started digging into the role that ndombolo music plays in our society. This music is so, so important for us. It is part of the daily life and experience of being in the Congo, really. It’s got incredible energy, but it’s there actually to help us forget about our problems—so it’s art as some kind of escape from reality. I started just questioning myself differently—like, “No, I can’t just play ndombolo, I have to investigate further what it means to us.” I came across a text by Achille Mbembe, the Cameroonian philosopher who lives in South Africa, called Variations on the Beautiful in the Congolese World of Sounds. I had never heard anyone talk about the role that music has played throughout the history of the country in that way. I started also looking into popular forms of music in Western society—mostly the rock scene in the late 1960s and early ’70s, and the punk scene in the late ’70s and early ’80s. The energy I was getting from these types of music was similar to the energy I get from Congolese pop. Wow! The punk scene had this energy and it was a form of rebellion. Why is it that, for us here, this energy is helping us forget? Is it possible to play ndombolo with a punk attitude? And if yes, what kind of slogan can we have? The punk scene had “no future,” but we cannot say “no” to a future whose promise is so far away from us. We need more future—so that’s how the title came about: more more more … future. We have sound, really loud, and we scream into the world how much we need to continue dreaming in the middle of this chaos that’s our heritage from our fathers. The lyrics to the songs in the piece are projected in English against a wall—where did that text come from? Vumi, Antoine Vumilia, is a friend of mine, a poet, who had been in jail for seven years when I talked to him about this piece. I said, “You’re here in jail for political reasons, and you’ve been even sentenced to death. When you hear “more more more … future,” what comes to your mind?” Two weeks later he sent me five texts, five poems, which became the heart of the lyrics for the songs that we were making. So going back to the initial impulse where I just wanted to dance? Again, here I am telling stories. It’s interesting that in your work you often seem to be finding the balance between an ecstatic response that the physicality of dance or music can give, and a kind of political rage. How do you navigate those tensions, in this work in particular? God, I wish I knew. Sometimes you just don’t have a choice. You have to go through this, you have to survive. The only way to survive—even if it’s only to remain capable of standing in front of a mirror and facing your own self—is to just take a stand. Sometimes I don’t even need to make dance about these tensions. They are just there and I have to deal with them. So it’s not a conscious thing so much as a feeling that you don’t have the luxury to just make a purely aesthetic artwork that can exist outside your country’s history? By making the choice of living in the Congo, developing work with people there—it’s somehow in the back of my mind that it’s possible to change my world, at a very small scale. That is definitely a conscious choice. But I’ll say that my ultimate dream is to simply be a poet. By “poet,” I mean being able to transcend all these contradictions. As a citizen I can afford to choose facts, to choose sides and say, “Okay, I’ll side with this cause.” And yet as a poet—as Walt Whitman put it, “Do I contradict myself? Yes, I contradict myself. I contain multitudes.” And so maybe there is tension inside me between this conscious political choice of being in the Congo, and wanting to be a poet in the middle of all that. That’s why I need the company of other artists—if we’re many, there is a chance of achieving some degree of poetry besides the weight of the situation. I always tell the team working with me, I wish I was capable of just making a piece about the beautiful flowers we have also in the Congo; only whenever I think about the flowers, it messes up the image I have of corpses that people were never able to bury, and who in turn fed the flowers. The imagining of a different kind of future has a particular power in your work in general, and this piece in particular. Could you talk about that role? With this piece, the screaming is so hard that it should be possible to dream, or to reinvent ourselves and thus give ourselves a future. Maybe today imagining a future is simply resistance to folly, to desperation, and because you keep some hope and you don’t despair—but you still recognize how difficult the situation is—it opens some possibility. Maybe it’s just giving myself the strength to continue being there. And hoping, because I’m not alone, maybe there’s a possibility of throwing some little virus in the middle of that society. This virus could be called “resistance,” and that’s hope and a possibility of a future, because you only resist when you think there is something to hope for, to look forward to. Flamme Kapaya is not well known in the United States yet, so can you talk about his role in this piece, and in the musical life in the Congo? Between 1997 and 2007, at least every year, you heard Flamme’s guitar in a hit song that made the entire country dance, because ndombolo is primarily a dance and party music. So he can walk on the streets of any city or town, and within 15 minutes you have hundreds of people around him. But when you reach such a status, there is less and less space for you to question what you’re doing. Basically, you give the people what they want and you stay there. It’s comfortable. So he says that he needed to go somewhere else. more more more … future was also for him a way of imagining a way forward. Hearing his remarkable facility and his technical virtuosity, while also knowing how his music has lived in a very popular world—in the villages and in the music of ndombolo—there seems to be a parallel with your work. There’s a high-art quality in its experimentation and its form, but it also connects on a popular level. Would you say that’s true? And your other collaborator on this work, Malian fashion designer Lamine Badian Kouyaté—it seems like Xuly Bët, his Paris-based fashion studio, is very high-end in some ways, but also has a kind of urban, pop, Afro-futuristic quality. How did you come to work with him? Lamine’s work is trendy … he says it’s “funkin’ fashion.” It’s about reinventing one’s self in the city, and about survival with what you have. But we’ve known each other for some time and have common friends, so it was not so much what I saw in his shops in Paris that made me invite him on the project, but it was how he talked about Africa—about, yes, the future. Inviting him to design original material and to discuss the fruition of this project was possible because I knew how he approached things. So, he really was a part of the conversation? Exactly, oh yes – it was really funk over fashion. He reacted to what I was telling him with his own background, his own ideas about the possibility of the future. With more more more … future, when one comes into the theater it’s almost as if things are already in motion and you take the audience through a journey—one that feels like it continues even after the show is over, like it might go on forever. How did you come to create this kind of structure? I definitely didn’t want a show where people come in, the lights turn down, and then it begins. And then you go home and that’s it. I felt it was very necessary to propose a space where we slowly invite people in—and you need time to open your house to people. It’s like warming up a relationship, really. Once you’ve invited people to come in, it’s compelling—they are going to check you out! So you have a back-and-forth between the house and the stage, and the to-and-fro of trying to sustain the movement with the audience. But of course, it takes a lot of energy to sustain a relationship. Sometimes, you can forget about yourself. So we’ve built in such a moment where we go back to ourselves. We close the circle. The audience might feel excluded, but we need to reassess where we are before we continue. It’s negotiating a relationship amongst ourselves, because we need to move as a group. Maybe that’s another statement about the future, because you cannot do it alone. We cannot do it alone.